Scented geraniums (Pelargonium) are similar to their larger geranium cousins but the foliage is smaller and more finely textured, and the blooms are aren’t quite as big and showy. Although scented geraniums are more demure, they’re a lovely plant available in a variety of different scents, including apple, peppermint, nutmeg and lemon. When dried, the leaves can be used in sachets or potpourris or to flavor tea. 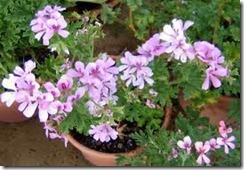 To start new plants, propagate scented geraniums in September or October. Cut a 4- to 6-inch tip from a healthy, mature scented geranium using a clean, sharp knife or pruners. Make the tip just below a leaf or a node, which is where a leaf or bud grows from the stem. Be sure the cutting has at least four leaves or nodes. Fill a 3-inch pot with a mixture of half peat moss and half perlite. Moisten the mixture with a spray bottle. The mixture should be damp clear through, but not soggy. Pinch the lower leaves from the scented geranium stem. Dip the cut end of the stem in rooting hormone liquid or powder and plant the stem in the potting medium with at least three nodes under the soil. Place the pot in a plastic bag and seal the bag with string or a rubber band. The plastic will act as a miniature greenhouse, keeping the stem warm and humid. Locate the pot where the scented geranium stem will be exposed to bright, indirect light. Don’t put the pot in a windowsill, as the sunlight magnified through the bag can be hot enough to burn the stem. Watch for the scented geranium cuttings to root in four to five weeks. To be sure, tug lightly on the stem. Roots will anchor the stem into the soil, and you’ll feel resistance to your tug. Repot the stem in a 6-inch pot filled with all-purpose commercial potting soil. Place the pot in a sunny spot and keep the soil lightly damp. Pinch off the tips of the cuttings in mid-January and again in early February. Pinching will create a full, bushy plant. Don’t pinch after the middle of February, as pinching the plant too late will cause blooms to be delayed. Plant the scented geranium outdoors in the spring after all danger of frost has passed or grow the scented geranium as an indoor plant. « Why Are My Geranium Leaves Turning Red?